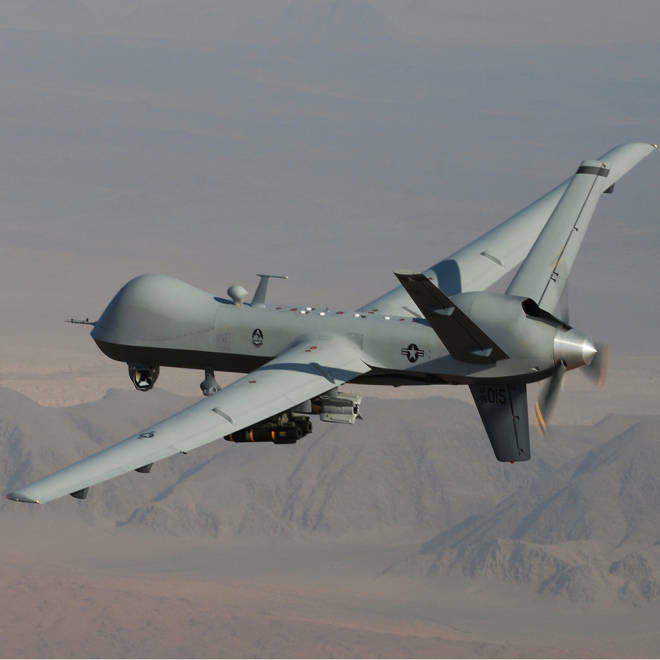 An MQ-9 Reaper, armed with GBU-12 Paveway II laser guided munitions and AGM-114 Hellfire missiles, flies over southern Afghanistan in an undated photo. The nine drone strikes that President Obama has authorized in Yemen since an electronic intercept revealed that al Qaeda leaders wanted to launch a major terror attack are strikes that the U.S. could’ve launched earlier this year, said military and intelligence officials. The strikes, which began on July 27 and have so far killed three dozen suspected militants, are not retaliatory and so far have not eliminated the threat that led to the temporary closure of U.S. diplomatic posts across the Middle East, said officials. The recent lull in drone attacks in Yemen, which lasted from June 9 to July 27, was the third pause this year. The pauses have come as the White House personnel responsible for drone strikes have changed and as the administration tweaks its criteria for when the missiles can be fired. The first significant interruption began in late January and lasted through mid-April. The slowdown coincided with a change in jobs for John Brennan, who had overseen the strikes for the White House as Homeland Security Advisor but left to become director of the CIA in March. The guidelines were intended to cut down on collateral damage to civilians, and made it harder to launch drones when civilians were present. They also took away some of the military’s freedom to act. Defense officials were left struggling to figure out what would make the grade, said the official. Monaco, who had day-to-day, operational control of the strikes, did not lessen their frustration. She applied a strict interpretation to the president’s new, tighter guidelines on when the button could be pushed and who could be targeted. The military’s roster was delivered to the White House, said the official, along with a message that eliminating the targets – most of whom were lower level militants -- was a question of “pain now, or pain later.” The White House could choose between criticism for alleged excessive use of drones or deal with the consequences of sparing the militants. But after the targeting packages were delivered, nothing happened. None of the names were added to the White House’s approved list of drone targets. Approximately six weeks ago, in June, military officials began to get antsy that the opportunity to hit their Yemeni targets was slipping away. There had been only two drone strikes in Yemen in May and two more in June, and then the strikes stopped. But then, in late July, the U.S. intercepted an electronic communication in which two of al Qaeda’s top world leaders, Ayman al-Zawahiri and Nasir al-Wahishi, agreed they wanted to launch a major attack on a Muslim holiday known as Laylat al-Qadr. This year the holiday, also known as the "Night of Power,” fell on the weekend of August 3 and 4. When the message was intercepted, said the official, things changed. After seven weeks without a drone launch in Yemen, the White House approved nine over the course of two weeks, starting on July 27. The targets were largely lower level operatives. The first attack killed six militants in a convoy in a town controlled by al Qaeda in the Arabian Peninsula. None were in leadership positions. More strikes followed on July 30 and Aug. 1, 6, 7, 8 and 10. In the U.S., three separate sources at three separate agencies all said they don’t know for certain whether al-Asiri was hit in the weekend strike. One senior official said, “We just don’t know.” Two others expressed skepticism, saying there’s no evidence to support any claim he was killed or wounded.